Sunshine for the last few days are cheering up things around us. Couple of days ago I noticed my tulip plants were sprouting and today I saw them being eaten by deer :(. Signs of summer are all around us even though the temperatures are still dangling between 30's and 40's. At least the sunshine keeps the mind refreshing and energetic. Versatility in breakfast is one thing kids always asks for. Providing a healthy breakfast keeps me on my toes to try different options that kids would enjoy. 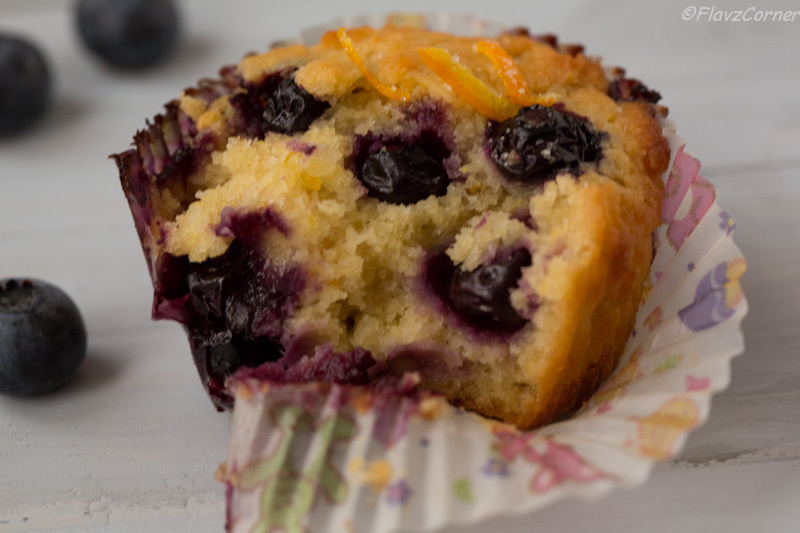 I came across the citrus topped blueberry muffin in one of the BHG magazines and wanted to try from the day I saw them. The recipe calls for butter, but I wanted to substitute it with something healthy and tried the non-fat Greek yogurt and I was really happy with the results. I also added some orange juice concentrate to get the orange flavor and substituted half of all purpose flour with wheat flour. Blueberries are rich in pro-anthocyanin natural pigment anti-oxidants. They are low in calories. These berries have other flavonoid anti-oxidants such as carotene-β, lutein and zea-xanthin. The phyto-chemical compounds in the blueberry help rid off harmful oxygen-derived free radicals from the body. They help to lower blood sugar levels and control blood-glucose levels. They are good source of minerals like potassium, manganese, copper, iron and zinc. Couple of years ago, I planted a small blueberry plant in my backyard and they produced 10-15 blueberries. I am planning to plant more this year. I am so excited for summer gardening :). Nathan, who doesn't eat blueberries by itself loved the muffin when mixed with orange. My daughter loves orange flavor. So it was a great success. I love the orange and blueberry combination and it was a moist muffin as you can see from the below picture. Pre-heat oven to 375 degree F.
Mix all the dry ingredients together. It is better to swift it once so that all the ingredients are mixed well. Mix all the wet ingredients together till blended together and is lightly fluffy using a electric mixture. Add the dry ingredients to the wet ingredients and gently mix using a rubber spatula. 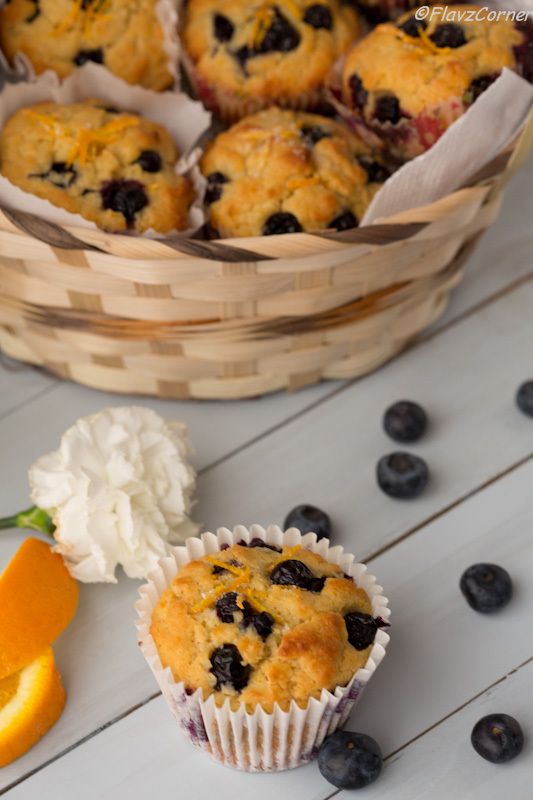 Fold in the blueberries gently and spoon the muffin mixture into muffin tins lined with muffin cups. Bake for 25 - 30 minutes till the top is light golden brown color. Transfer to a wire rack and top them with orange peel sugar mixture. If using frozen blueberries, add them into the batter just before baking, otherwise they will ooze out lot of moisture and the muffins will look bad. 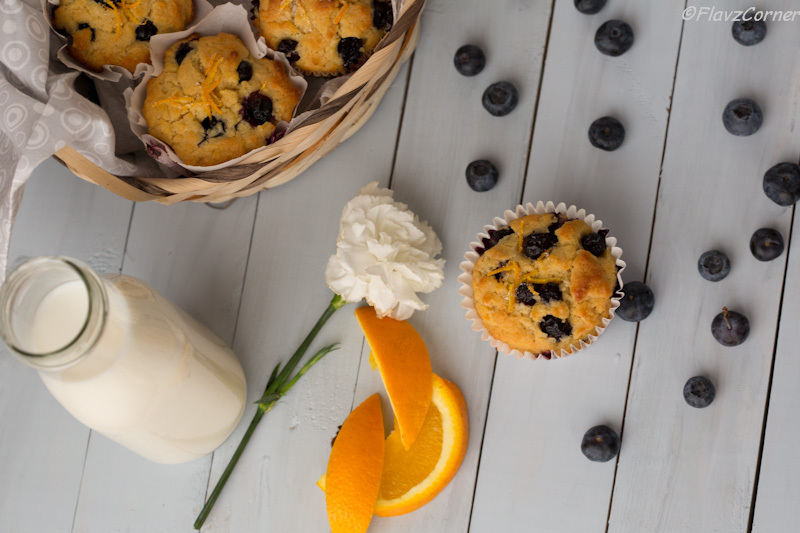 You can use a orange glaze as topping by mixing 1/4 cup powdered sugar with 2 - 3 tbsp of fresh orange juice and spoon them on the muffins. Store the muffins in air tight container. You can also freeze them by keeping in zip lock bags. They look Lovely !love the colour and the way ur presented it.can smell the citrus flavour from the pics ! Thanks Vineetha! Yes, the orange zest and orange concentrate really enhanced the flavor of the muffins. wow Shibi...These muffins looks gorgeous...It has everything that i/we like..Looks perfect! 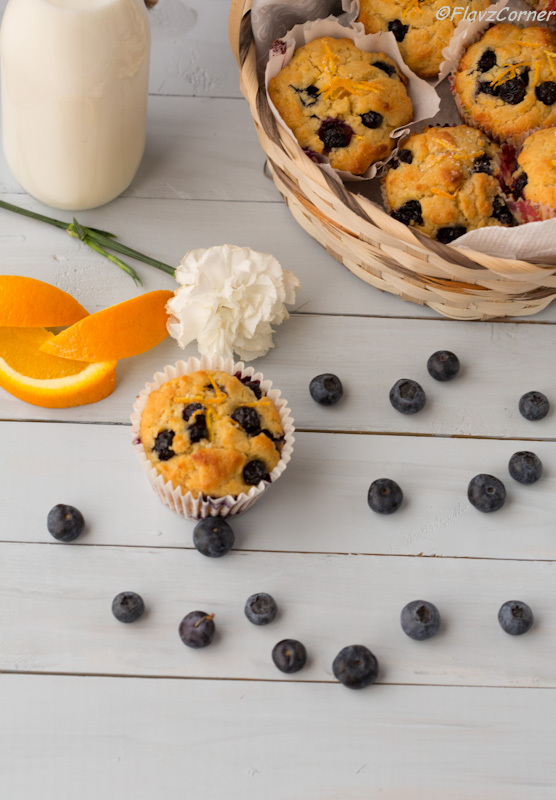 Blueberry muffins - they are my favorite! As a matter of fact I don't eat another kind, just blueberry muffins, but I've never cooked, just store bought. This recipe made me think that I should try and do it myself, it looks so damn delicious, and I like the ingredients you used.